Merrell shoes are a brand of shoe frequently used for outdoor activities like hiking. 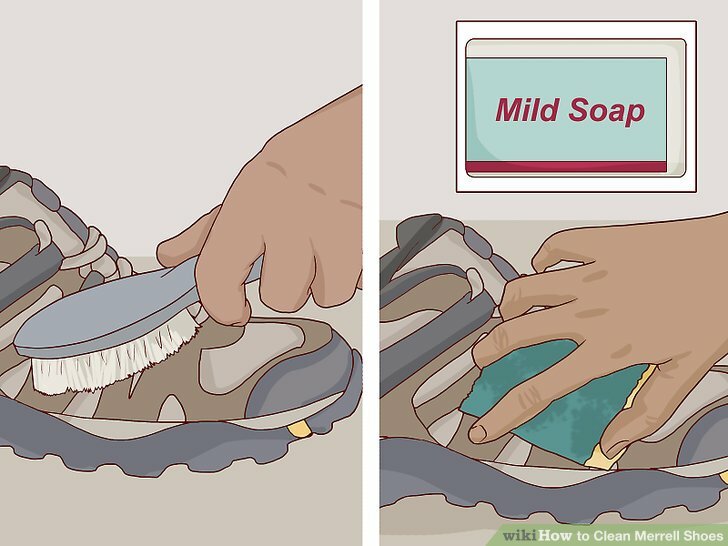 The Merrell company recommends cleaning your shoes with mild soap only to avoid damaging the material. 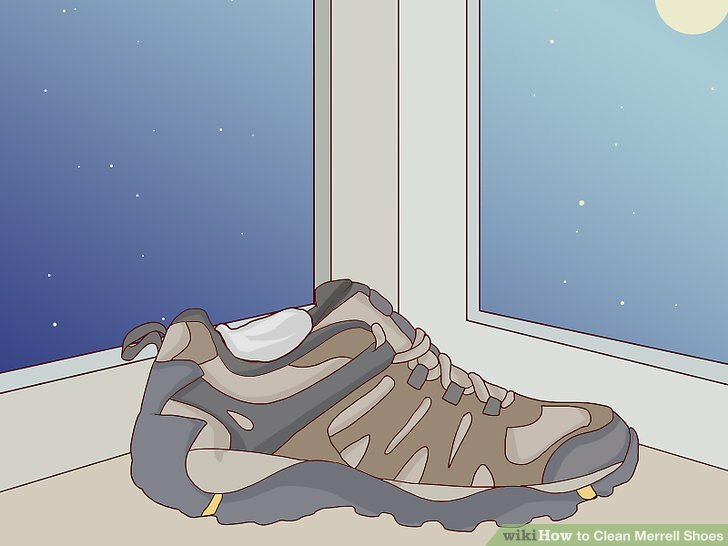 If your Merrell shoes build up unwanted odor, target this with baking soda after cleaning them. With a little care, Merrell shoes can last for a long time. Brush off small amounts of dirt regularly. As Merrell shoes are often used for outdoor activities, they’re prone to building up dirt and other debris. 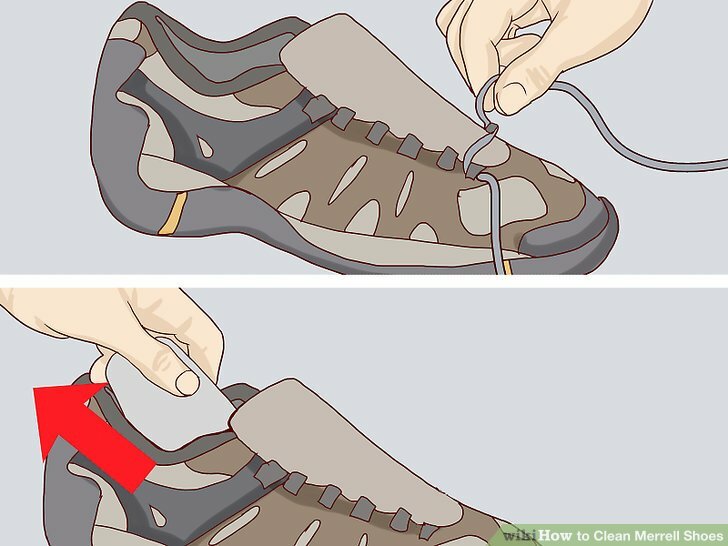 Make a habit of cleaning Merrell shoes after each use. 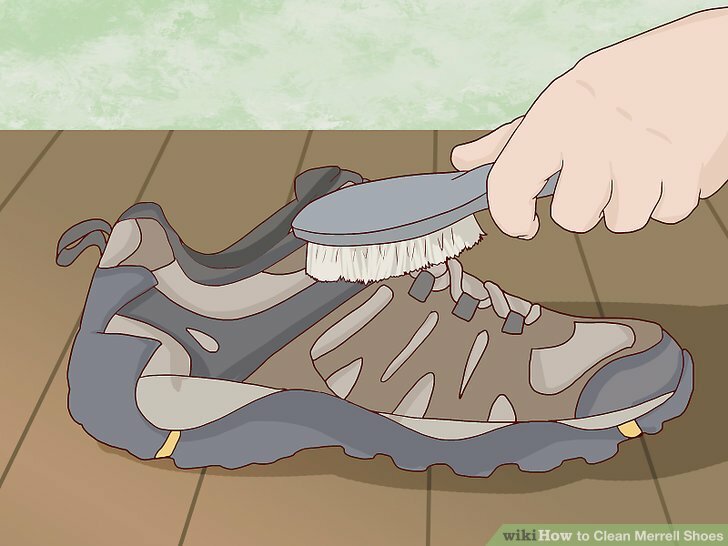 After wearing your shoes, use a soft brush to gently brush off any dirt or debris. If you’re vigilant about brushing off dirt regularly, it’s less likely to build up on your shoes. The less you have to wash your shoes with soap, the better. Use mild soap to remove stains. If your Merrell shoes get heavily stained, muddy, or otherwise dirty, avoid using any harsh products on them. These can damage the material. Instead, use mild soap and water to wipe off any set-in stains. 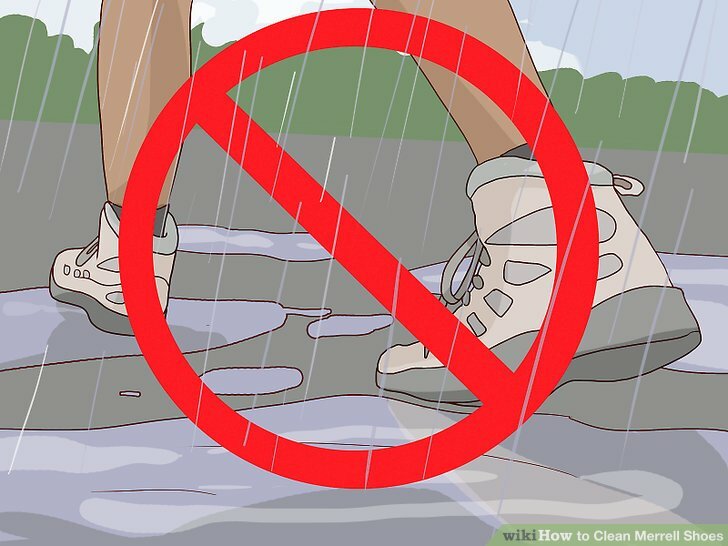 Then, rinse your shoes completely under running water. You can apply the soapy water with any cleaning utensil. Make sure the shoes are completely rinsed after use. Letting soap residue sit on your Merrell shoes can cause damage. Keep rinsing them until the water runs clean. Dry your shoes at room temperature. Merrell shoes should air dry naturally. Remove the laces and insoles of the shoes. Set the shoes, laces, and insoles in a safe place in your home that remains steadily at room temperature. Do not wear the shoes again until they’re fully dry. Drying times vary depending on how much water you used when cleaning your shoes. Sometimes, Merrell shoes may need to dry overnight. 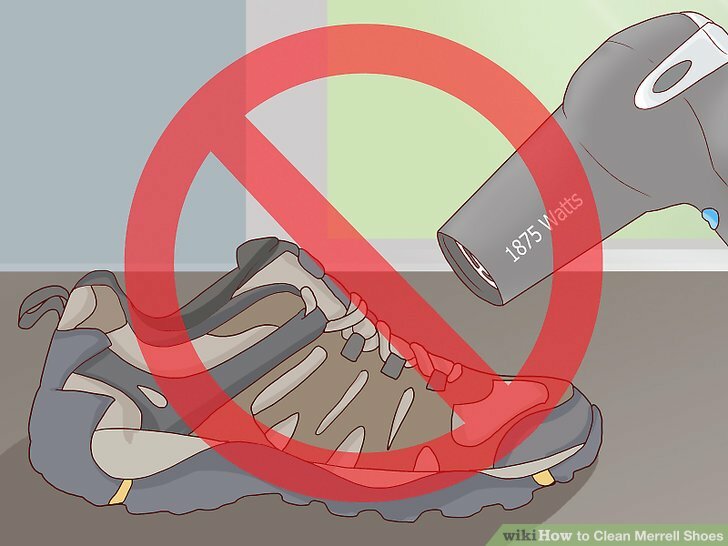 Do not expose your shoes to heat after washing or drying them. Merrell shoes should not be dried using heat treatments. Keep them in a cool area and never use something like a dryer or hair blower to dry your Merrell shoes. If your shoes have a built up odor, you should target this after washing them. Do any routine cleaning, such as brushing off dirt or washing the shoes with water, before attempting to remove odor from your shoes. Make sure your shoes are completely dry before adding baking soda to remove odor. Sprinkle the boots with baking soda. Sprinkle some baking soda on the inside of your shoes. You can also fill a sock with baking soda and set it in the shoes. The sock method is recommended as it reduces the risk of leaving baking soda residue in your shoes. Let the baking soda sit on overnight. Place the shoes in a cool and dry place in your home. Let the baking soda sit on overnight. This will give it time to remove any unwanted odor. If you put baking soda in your shoes loose, turn them upside down and shake out the baking soda. Make sure to get it all out to avoid damaging the shoes. If you used socks, simply remove the socks from your shoes. Your shoes should smell noticeably fresher. 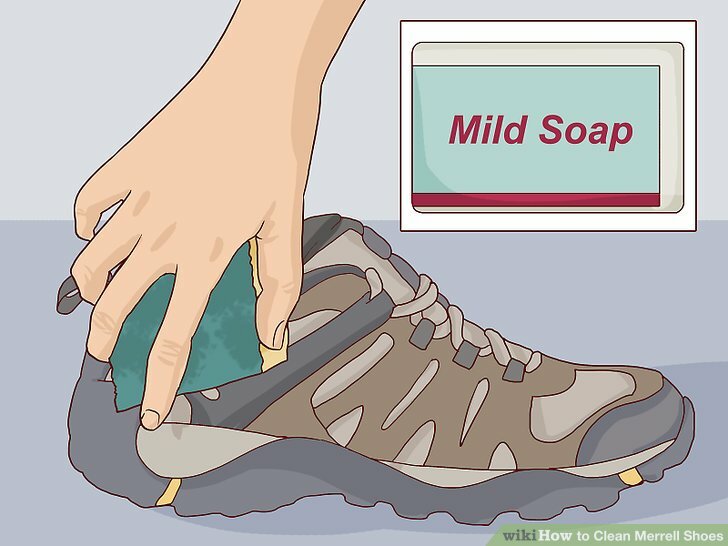 Before you use any soap on Merrell shoes, even mild soap, test the soap on a small, unnoticeable area of your shoes. Make sure it does not cause any damage, such as discoloration, before applying soap all over your shoes for cleaning. If a soap does cause discoloration, try a different soap until you find one that does not damage the shoes. Moisture can make shoes more likely to become discolored, damaged, or dirty. Try to avoid using your shoes when it’s raining or snowing. Keep them in an area of your home that is not prone to excess moisture. Use a protectant spray to cut back on cleaning. 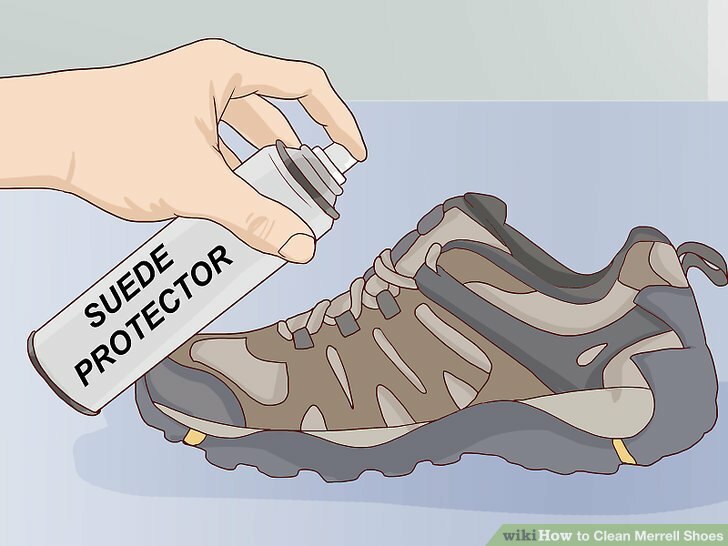 You can buy suede protector sprays online or at a local department store. Mist the shoes with a layer of the spray and let it sit on for as long as the label recommends. A protectant spray will make the shoes less prone to damage, dirt, and debris. This way, you will not have to clean the shoes as frequently. Different sprays have different specific directions. Make sure to read a bottle’s instructions closely before using it on your shoes.